One of the greatest criticisms of mainstream and academic history is that it focuses on, and thus legitimizes “dominant” narratives from the perspective of societies most powerful figures such as politicians, business leaders, and so on. A lot of this has to do with the materials that historians have traditionally used to craft their stories: written and printed documents. To correct this imbalance social historians began employing different sources and methods, most notably oral history, to help preserve and interpret the perspectives of society’s more marginalized and oft-forgotten members such as ethnic minorities, working-class families, and women. 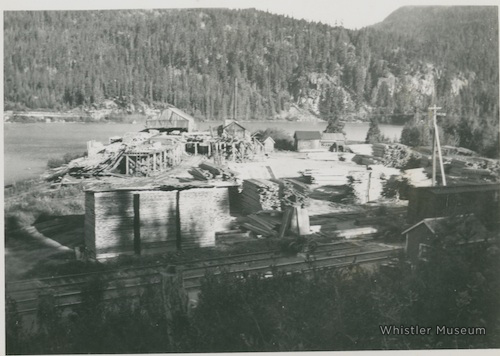 The Whistler Museum is fortunate to hold in its archives dozens of oral history interviews and written correspondence conducted since the early 1980s that tell important and insightful aspects of our valley’s history that would have otherwise been lost with the passage of time. Between 1948 and 1956 Olie and Eleanor Kitteringham, along with their children Ron, Jim, and Linda (born Valentine’s Day, 1949), called Parkhurst their home. Thanks to a 1989 letter written to the Whistler Museum by Eleanor entitled “Our Family Life at Parkhurst” we have insights into the tight-knit community. Eleanor’s recollections are full of details about the seemingly endless work it took to raise a family in this remote mountain outpost, but she clearly looked back fondly upon those trying years. Surviving three changes in ownership and one full-fledged fire, a lumber mill operated more or less continuously from 1923 to 1966 at the Parkhurst site (named after the original landowners) on the north-east shore of Green Lake. Afterwards, the remaining structures were occupied by ski bums during Whistler’s squatting heyday, and the collapsed remains of a dozen or so houses (along with a few decaying vehicles and the squatters’ garbage heap of broken bottles, rusty tin cans and the like) can still be found on the largely grown-over site. I always said to the family, if you are going to get sick it has to be on Wednesday, Friday or Sunday, that’s the days the passenger train went on through from Lillooet to Squamish… (Once) Ron was delirious for 3 days with a very high temperature. My doctor book said it might be bronchial pneumonia, so I phoned the doctor [there was a hand-dial phone in the mill office] and asked that I have some Penicillin thrown off by the next freight train at our station – it worked. We walked the tracks in the winter with [baby] Linda in a clothes basket tied onto a sled … We played canasta, drank homebrew. Pretty hard to have to wake the kids and walk the two miles back. Those nights were quite beautiful though, when you can touch the stars and everything sparkles and glistens and that “crunch” of dry snow. 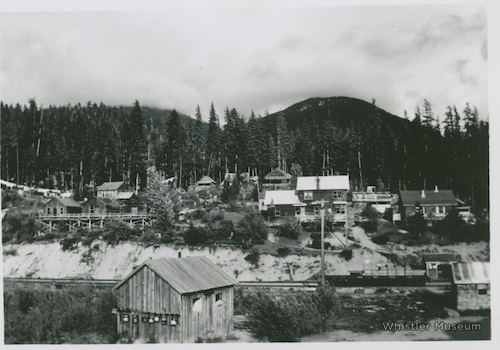 Middle child Jim later settled in Emerald Estates – the only original Parkhurst resident to live in Whistler. He took his mother for a tour of the old mill site three decades after they lived there. By then most of the site had been flattened by neglect and and persistent winter snowpacks, but she could still identify the remains of the family chicken coop, rabbit pen, children’s playhouse and the single-log wharf they swam from in the summers. This entry was posted in Beyond Skiing, From the Archives, Pioneers and tagged forestry, Green Lake, logging, oral history, parkhurst, parkhurst mill, pge railway, pioneer, Whistler, women's history. Bookmark the permalink.